Once the initial meal is past, and the family has eaten all the roast beef sandwiches any sane people can handle, what can a cook do to use up extra leftovers? My ‘journey’ to this recipe started with a trip to visit my brother-and-sister-in-law at the beach. They used to live in coastal Oregon. Our last trip to see them, we had dinner in town before descending on them in force. Me being the research queen, I figured I’d find us a nice restaurant in Astoria. I thought I’d find a nice, local seafood restaurant that was highly recommended by the locals for its fresh, affordable fish. Ha! Things may have changed in the years intervening, but what I found is that every seafood restaurant on the coast that is under $50 a plate is using the same frozen, pre-processed-at-some-inland-plant-seafood that every fish restaurant in the country uses. Not what I was after. The only notable exception, the Bowpicker (which I recommend), wasn’t open for dinner. So I cast my nets, figuratively speaking, a bit wider. And snagged a review of a Bosnian restaurant called “Drina Daisy”. The website promised roasted lamb, and reviews were complimentary. A Slavic restaurant with a chef from Sarajevo in Astoria?? This I had to see. It was a very nice restaurant, and I’d go again. The advertised lamb was ‘meh’, but the rest of the meal was amazing. I was introduced to pickled green tomatoes, which I promptly went home and recreated after our trip. We tried an herbal ‘cola’. Mr. Caffienated had a Turkish coffee, which he declared was the first coffee he’d ever had that was too strong to drink straight. (This from a man who regularly drinks things I term “paint thinner” or “brew that would melt metal”.) 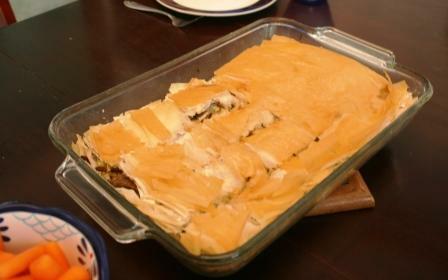 The highlight of the meal, however, was a casserole the menu called “burek”. It was some sort of shredded meat and onions – there may have been cabbage in there – layered in fillo dough, and served with a sour cream sauce on the side. It was delicious, and we all – kids included – devoured it to the last crumb. I came home vowing that, once I’d canned some tomatoes, I was going to recreate burek as well. As it turns out, it seems that ‘burek’ is a comfort food for half of Eastern Europe. 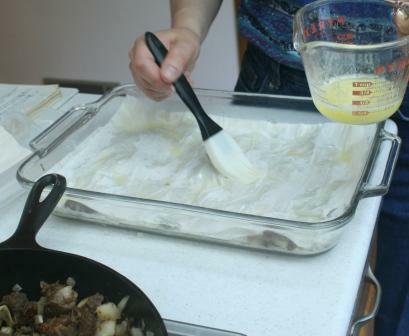 Find ten cooks that bake burek, and you’ll get twenty recipes. The formula appears to be fairly simple: butter a dish and put in a half dozen fillo dough layers, brushed with more butter. Sprinkle in a layer of filling. Layer on another half dozen fillo. Repeat filling. Repeat fillo. Bake till golden. 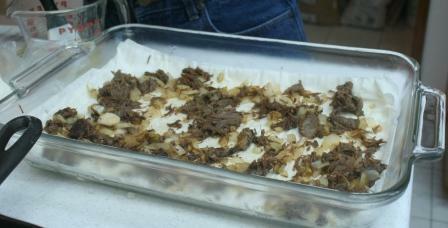 This has morphed into being my family’s favorite use for roast beef leftovers. I chop an onion into the same size I’d use for salsa. Saute with a bit of bacon grease. 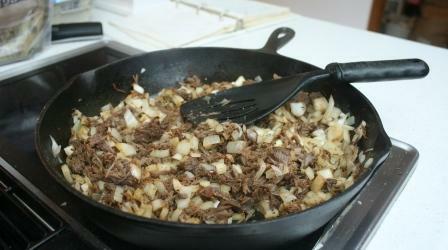 Add leftover beef – a couple of cups or so. It’s not an exact science. Season with salt, pepper, paprika. Maybe ½ t. each – although I go light on the pepper for the kids. 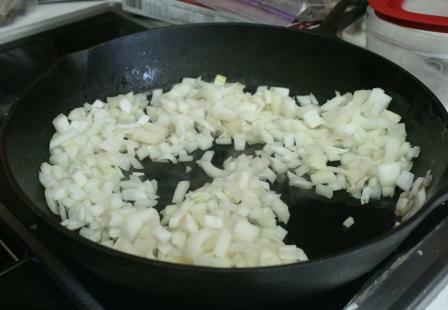 Pull the filling away from the center of the pan and sauté a few cloves of minced garlic for 30 seconds. Then toss all the filling together and turn off the heat. Spray or butter a 9×13 glass pan. 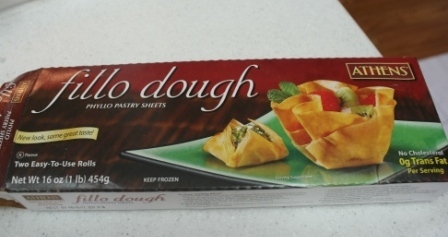 You can find fillo dough in the freezer section of the grocery store, generally tucked in next to the pie crusts, puff pastries, and Cool Whip. Add a couple of layers of fillo and brush – sparingly – with butter. All the recipes I’ve read say to brush every layer of fillo, but the butter soaks all the way through. So I figure every other layer is sufficient. 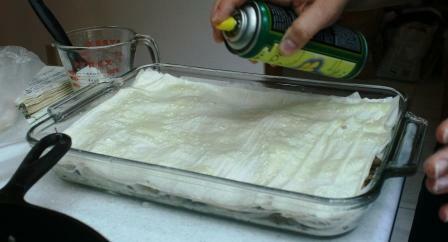 After six layers of fillo, add a sparse layer of filling. If you make the layer cover every inch of the fillo, you’ll have a lot higher filling:fillo ratio than we personally go for. Add six more layers of fillo, brushing alternate layers with butter. Repeat for one more round, then end with 4-6 layers of fillo on top. 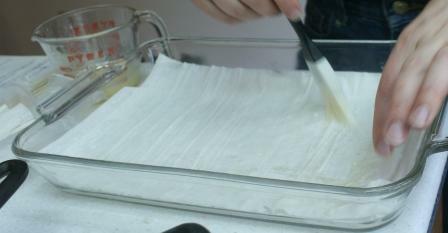 I spray the top with oil, to make sure I cover every bit of fillo on top. At this point, you can refrigerate the works overnight and bake it tomorrow. Bake uncovered for 30-40 minutes at 350°. Serve with sour cream. If you’re feeling really fancy, mash up some roasted bell peppers and stir them into the sour cream. Cut with a knife and serve with a pie server. 2 c. (-ish) cooked beef. Shredded or ground is fine. 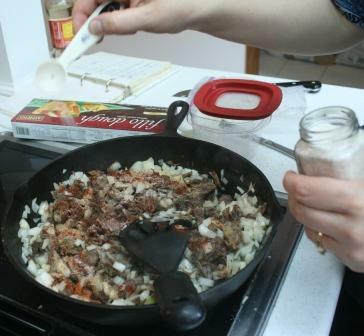 melted butter – about 1/3 c.
Saute onion in bacon fat. 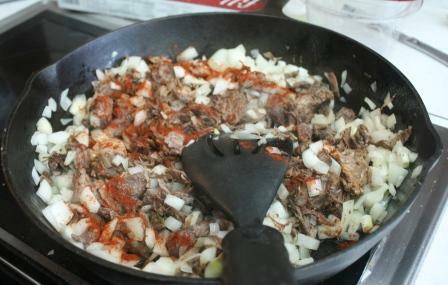 Add beef and spices. Saute till beef is hot. Clear a space in the pan and sauté garlic for 30 seconds. Stir filling together and set off heat. Butter 9×13 glass casserole dish. Add fillo, brushing alternate layers with melted butter. After six layers fillo, add 1/3 filling. Repeat six layers fillo, brushing alternate layers with butter. Repeat fillo and filling one more time. End with six more layers fillo. Brush or spray top layer thoroughly. Bake 30-40 min. at 350°, or until fillo on both top and bottom is golden brown. Special thanks to Mrs. M, again, for taking the pictures! This entry was posted in Baking, Comfort Food and tagged beef casserole, Bosnian, burek, dinner, fillo, fillo dough, leftover roast beef, roast beef, slavic. Bookmark the permalink. We made this for dinner on blueberry/blackberry canning day!! Actually Amanda made it. YUM! It was delicious. Amanda proposed adding cheese next time. We just used ground beef as we didn’t have any roast leftovers, and she added some peppers from the garden. Are you willing to share your recipe for the green tomatoes? I am from NH and had dinner at Drina Daisy in Sept and we LOVED the green tomatoes. My husband and I were fighting over them. My dad made pickled green tomatoes and they are very good, but we both liked the Drina Daisy ones better than my dad’s. (Sorry dad). I have a boatload of green tomatoes right now but can’t find a recipe that seems like it will turn out like the ones they made. Absolutely! I got this recipe from a student’s mom a few years ago (her name is also Patty! ), and I use it for all of my dill-style pickles. I double-checked the brine proportions, and it’s well within the acidity levels required by Ball and universities that do canning food science. The real trick is to use the best quality apple cider vinegar you can get your hands on. I use the organic, unfiltered ACV from Azure. Bragg’s is good, too – you can usually get it in the vitamin outlet stores here by the gallon for half or less than the grocery stores around here charge. Absolute worst is the store-brand ACV at the grocery store. I checked the labels – most of it is actually distilled white with apple cider flavor added. Blech! The McCormick’s pickling spice available at the store is fine. I use the pickling spice mix from Market Spice, and we really like that. I think it’s usually fresher than what’s in the store. Taste is very similar. ½ t. crushed red pepper per qt. 1 t. pickling spice per qt. Put all ingredients except cukes in jar. Cut onions, then pack cukes. Begin heating water bath, then prepare brine. Cover to 1/2” with boiling brine. Wipe lids, screw on rings. Process 10-15 minutes. Remove and store 6-8 weeks, to allow flavors to penetrate Pickling spice quantity is variable; brine is not.